For Access to a Radar that allows you to track Gustav as it approaches the US by zooming in to street level, making a radar loop, put in clouds and lighting, CLICK HERE. It will default to the Ohio Valley, but simply navigate it to the Gulf Coast or anywhere else in the nation. Check out the Report from some ship that found itself in Gustav in the Gulf of Mexico….that’s 60 knot winds and 45.9 foot seas. Hope they took their dramamine. take it farther east. This is still a formidable storm and the weakening of the system should be of great relief, but it will still be a dangerous, life-threatening storm. It will get stuck inland over east Texas and rain fall of 1-2 feet is possible inland. INTENSITY IS LOWERED TO 100 KT. WESTWARD AS IT WEAKENS OVER LAND. CONTINUED SHEAR REDUCES THE CHANCES OF SIGNIFICANT INTENSIFICATION. LANDFALL AND BECOME A REMNANT LOW IN ABOUT 120 HR. To track Gustav as it approaches the US coast using a radar that you can navigate yourself (down to street level), CLICK HERE. It will default to the Ohio Valley but you can take it anywhere any time and make it loop (animate) put on clouds, lightning and even have some computer generated analysis. 11am were placed at 120 mph with a pressure rise to 962 mb. The storm continues to not recover well from its encounter with Cuba as the upper level environment has not been friendly. 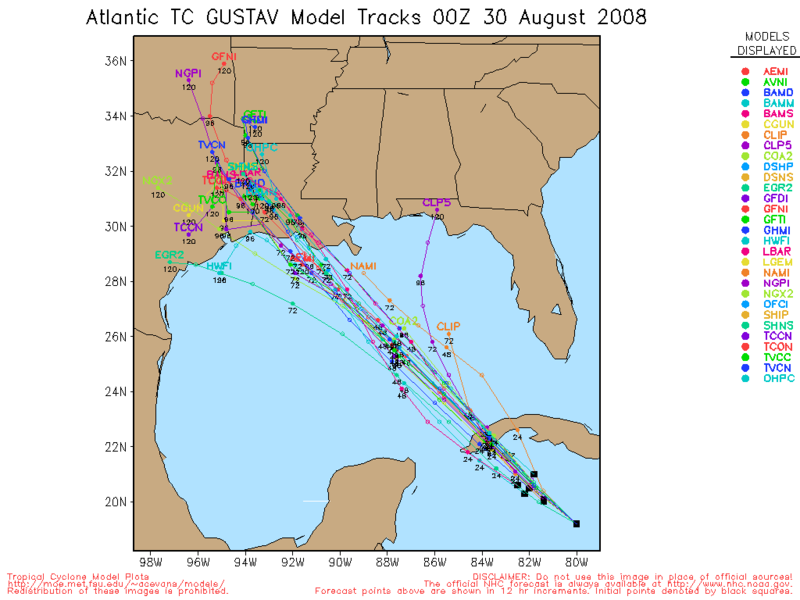 Modeling data is also coming around again to a slightly more western landfall. For an interactive radar that you can navigate and control to show clouds, radar imagery, radar loops and computer analysis as well as lightning, CLICK HERE. It defaults to the Ohio Valley but you can go to street level anywhere in the nation. As Gustav gets close to coastal radar installations, you can track its movement. Louisville Weather: A big fat high is over us and the weather will be grand all Labor Day Weekend. Highs in the low 90s lows in the upper 60’s to near 70 with tons of sun. along with the size and intensity of the storm, that a Hurricane Watch remains in effect from High Island, East of Galveston to just east of Mobile at the FL/AL border. I”ve included the US Naval Research Laboratory’s version of the NHC forecast track as well as that put out by the NHC. Regarding the intensity, there are some potential inhibitors to the intensity but nothing overly substantial. Perhaps some slight shear and the NHC indicates that after going over some extremely warm water, there may be some pools of relatively cooler water that the storm will go over. Nevertheless, a strong Cat 4 hurricane at least remains in the cards with a projected landfall intensity of 135-140 mph with higher gusts. If you are wondering about Hanna…the spagetti model for it has done an about face and many models now take it back to the north and out to sea, perhaps anticipating the big fat high lifting out to the northeast. The NHC official track has changed to reflect this new data. 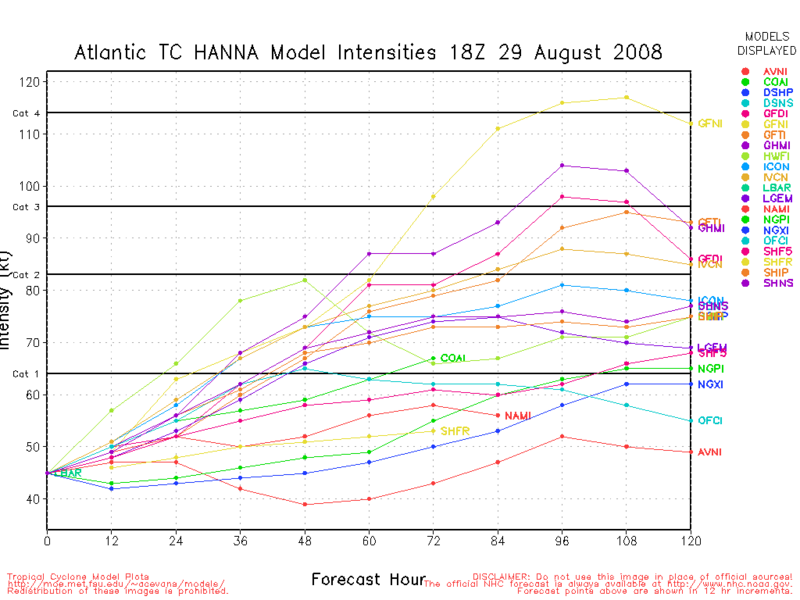 Let’s get through Gustav first but east coast and Florida residents should keep an eye on Hanna. LOUISIANA COAST…WHICH APPEARS UNLIKELY AT THIS TIME. 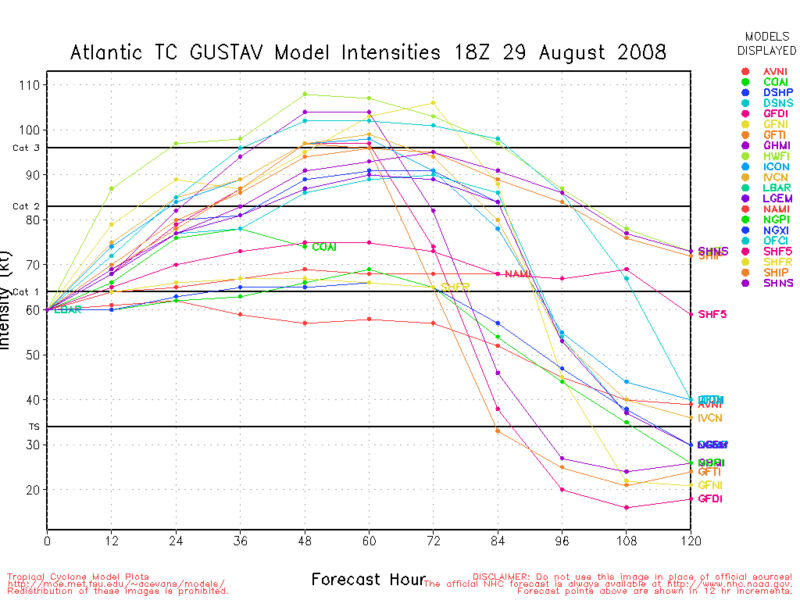 VARIOUS FACTORS…THIS IS A LOW CONFIDENCE INTENSITY FORECAST. NORTHERN GULF COAST ON THE NEXT ADVISORY. As of 7 pm EDT on Saturday, the eye of Gustav is visible on this radar image and loop is visible on this US Interactive Radar. CLICK HERE now and track the storm and as it approaches the US coast, you can make a Hurricane Gustav Loop and track the eye yourself, 24/7. OFFICIAL FORECAST AGAIN FOLLOWS SUIT. 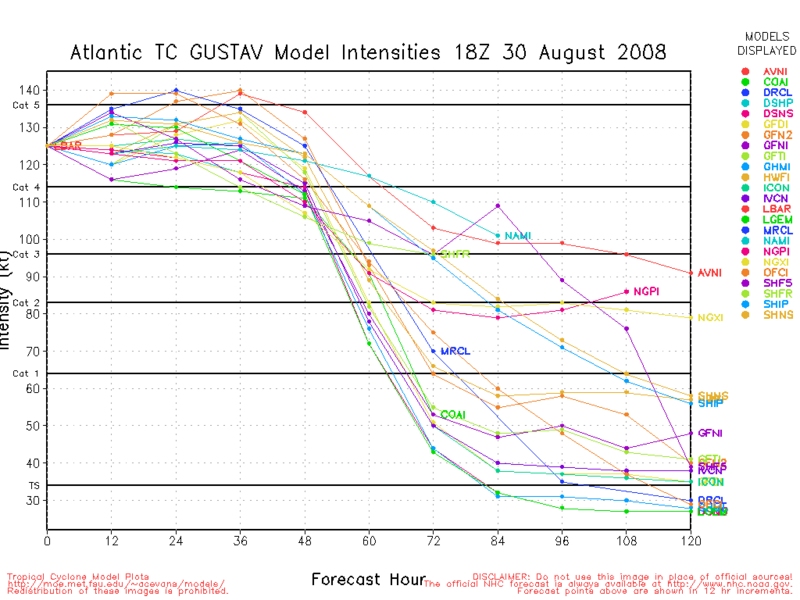 NOT TOO DIFFERENT FROM THE GFDL AND HWRF. WATCHES ALONG THE NORTHERN GULF COAST. 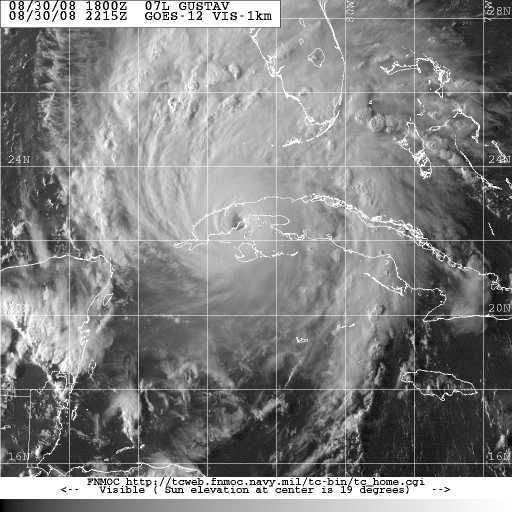 For a more recent update on Hurricane Gustav, CLICK HERE. There is also a interactive radar with which you can create a Hurricane Gustav Radar Loop when its in range of radar installations. storm at landfall I would recognize that the area will get an extreme storm surge consistent with a Category 5 hurricane, regardless of what the actual intensity is at landfall. The landfall estimate remains generally consistent toward the SE Louisiana Coast from along the east side of Vermillion Bay toward Fort Polk. 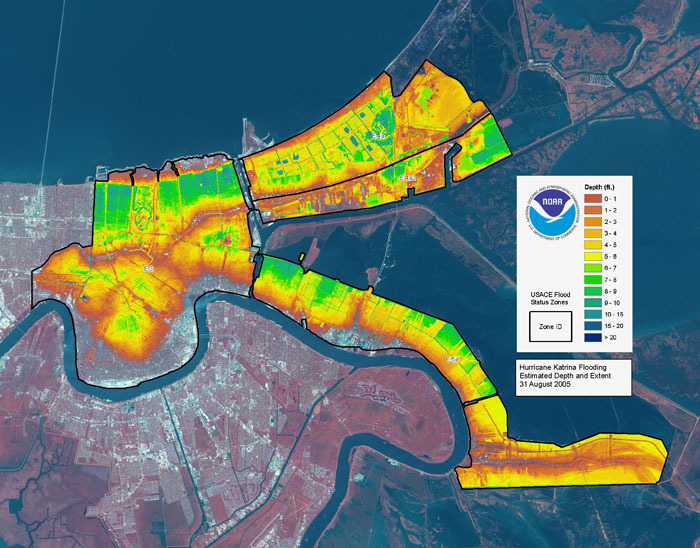 A pretty decent storm surge may affect New Orleans. The more the storm deviates from the path to the east, the greater the risk for a surge up Lake Borgne (similar to Katrina) becomes. The farther west the storm deviates from the path to the west, th less the risk. I’ve gotten emails from folks in South Louisiana. I am still not convinced that this track is Gospel and many variables remain as to the track of the storm, but I can’t find anything regarding the intensity that would make this less ferocious. As for now, given the current official forecast, if you live anywhere from Pecan Island to Boothville, I would not mess with this storm. 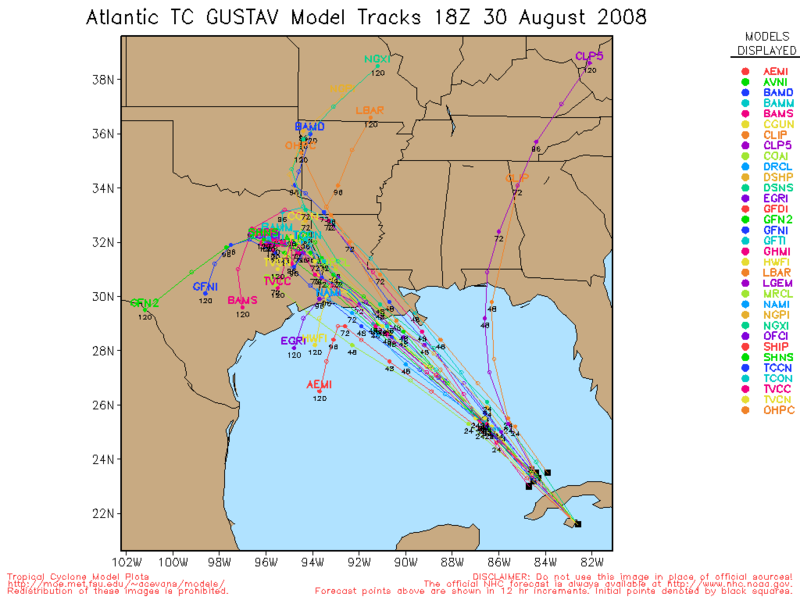 I’ve seen the slosh model computer predictions and you cannot believe how far the models take the Gulf of Mexico inland with this type of storm. 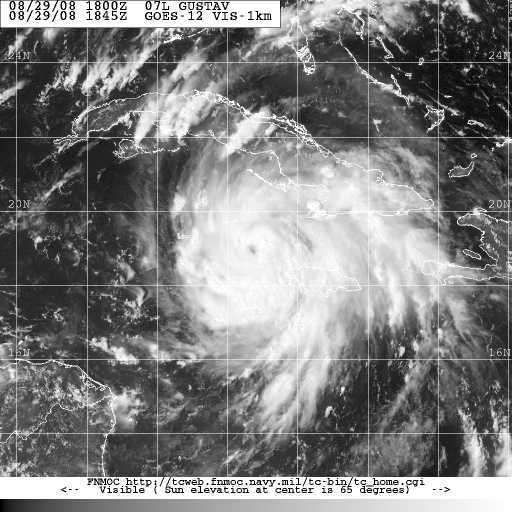 Gustav is currently the most powerful force on the face of the earth and you cannot win if it maintains this intensity or increases. If you think I’m trying to scare you, I am. I saw what Camille did in 1969 first hand. Its why I got into Meteorology. I went to Mississippi and New Orleans after Katrina to rebuild houses. 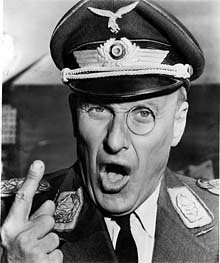 People in Mississippi said “we didn’t think the water would come up this far.” Be like “The Who” and don’t get fooled again. The latest spaghetti models won’t come out for awhile. For now here’s the NHC 2pm discussion. 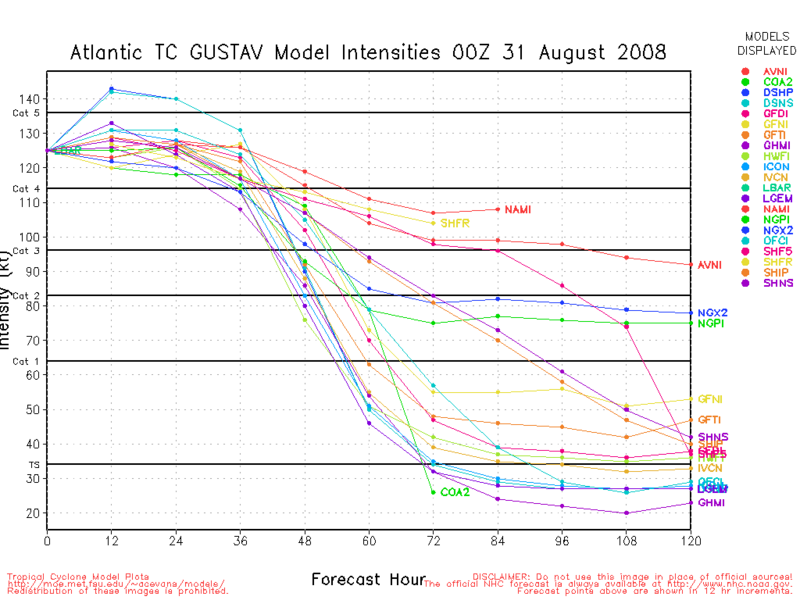 SO MUCH FOR A SLOWDOWN IN THE INTENSIFICATION RATE OF GUSTAV. WEAKENING OVER THE NORTHERN GULF WHERE OCEAN HEAT CONTENT IS LESS. force on the face of the earth at this time with a heat energy output on the order of a 10 megaton atomic bomb every 20 minutes. Cuba should not be too much of an impediment, though since Gustav may clip more of western Cuba, it may knock it to the canvas for a standing eight count and then Gustav will come out swinging again. are conducive over a period of time for a Cat 5 hurricane, then there are eye-wall replacement cycles that go on in which an eye collapses and a new one forms. During this process, the storm tends to lose intensity before regaining form. We’ve had several big storms approach land as it was going through a replacement cycle and they hit at a lesser intensity. However, don’t be fooled. 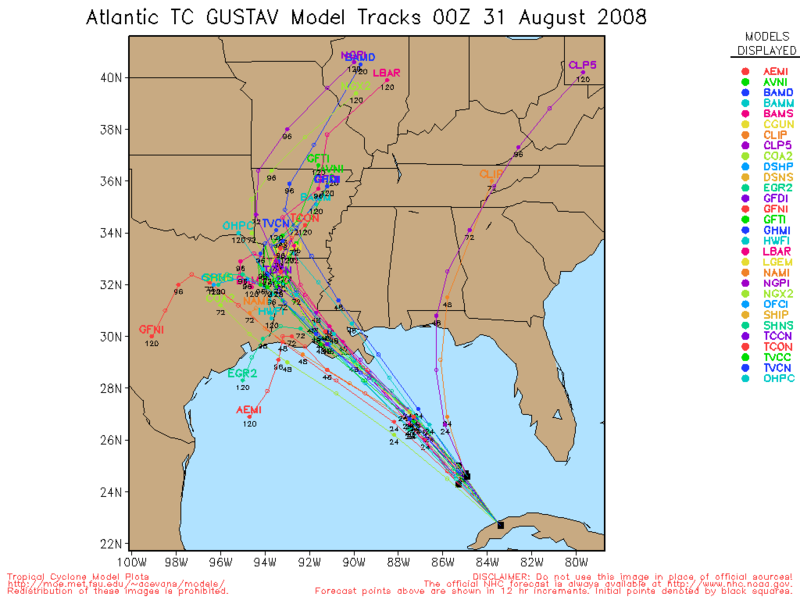 Katrina was a Cat 5 that went through a replacement cycle. It was officially a cat 3 when it made landfall. 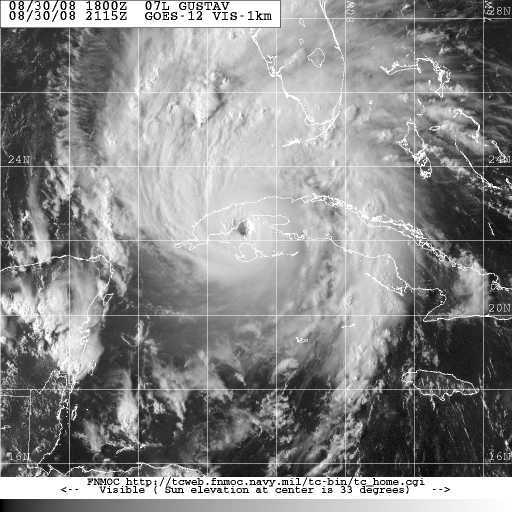 But, the storm surge was consistent with a landfalling category 5 hurricane. It also appears from my observations over the years that during a replacement cycle the wind energy field, while diminishing its maxima, seems to expand. So, instead of having a max wind of 150 mph with 100 mph winds 60 miles out, there is a max wind of 120 mph with 100 mph winds 100 miles out. In other words, it doesn’t really lose kinetic energy, its just expanded over a larger area. That is just an observation of mine…no research no study….just the world according to Bob. 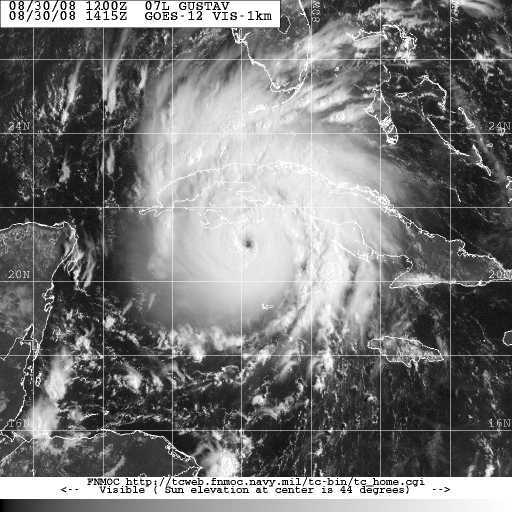 As was my suspicion…Gustav is increasing in intensity very rapidly. 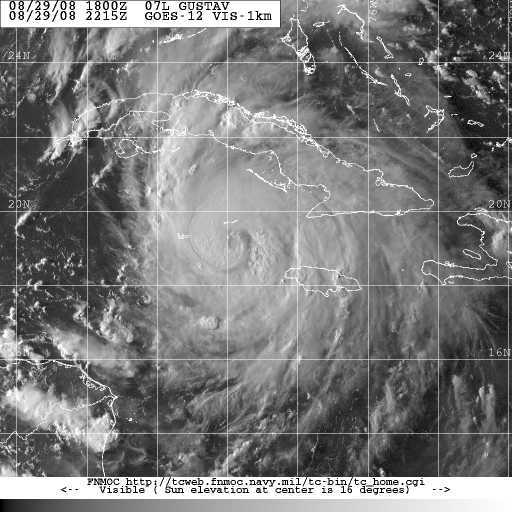 The 11pm report had it at 80 mph with a pressure of 974mb, though I had seen a recon flight of 970 mb. By 2:10 am, winds were reported at 100 mph. As I said in the previous post, it will probably continue to increase in strength rapidly and it is not out of the question for this storm to, for a time at least, be stronger than currently forecast, even though there aren’t too many models that support this supposition on my part. However, if you look at the Intensity Probability Table issued by the National Hurricane Center at 11pm, you will note that by Sunday, it has a 28% chance for it being at Cat 4 (131mph to 155 mph), second only to the 41% for it being a Cat 3 (111mph to 130 mph). 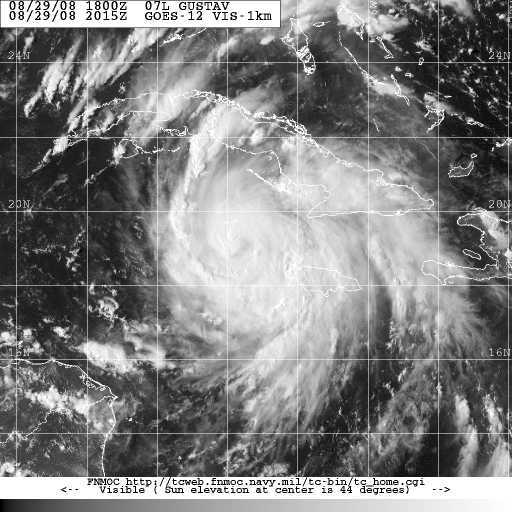 HURRICANE ON THE SAFFIR-SIMPSON HURRICANE SCALE. 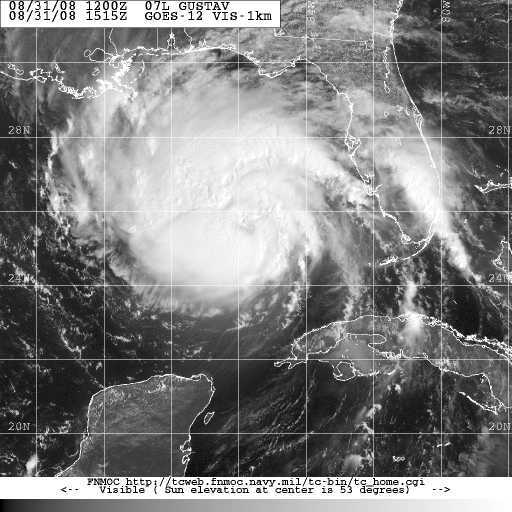 Hurricane Gustav Getting All Dressed Up…It’s Got Somewhere To Go. A big area of high pressure will build into to the Ohio Valley over the weekend and bring us dry and warm weather through Labor Day. That high will determine the fate of both Gustav and Hanna. As the ridge builds in, it will also build south. If the ridge builds in fast, then it could drive Gustav farther west. 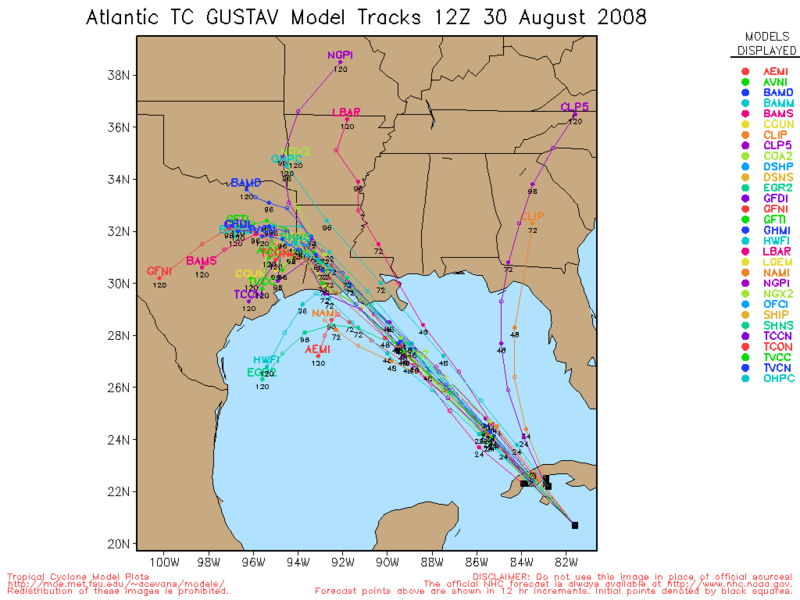 Some models want to take it to the Texas coast. If the ridge comes in slower or weaker, then Gustav conceivably could be driven farther east of the track…not just to New Orleans but possibly Mississippi. That is not a very popular solution on the spaghetti model chart. The National Hurricane Center forecast calls for something in the middle and pretty close to the median of the cluster of model tracks. Should the storm make landfall west of New Orleans, eventually some of that moisture could make it back our way by late next week. If it’s east of New Orleans, then we Louisville get nothing. As the ridge builds farther east into the Atlantic, data indicates that it will pick up Hanna, drive it southwest and then west across Florida and into the Gulf. will be, for a time at least, a bit stronger than forecast and will probably increase in strength pretty quickly. The weekend could be interesting on that front. 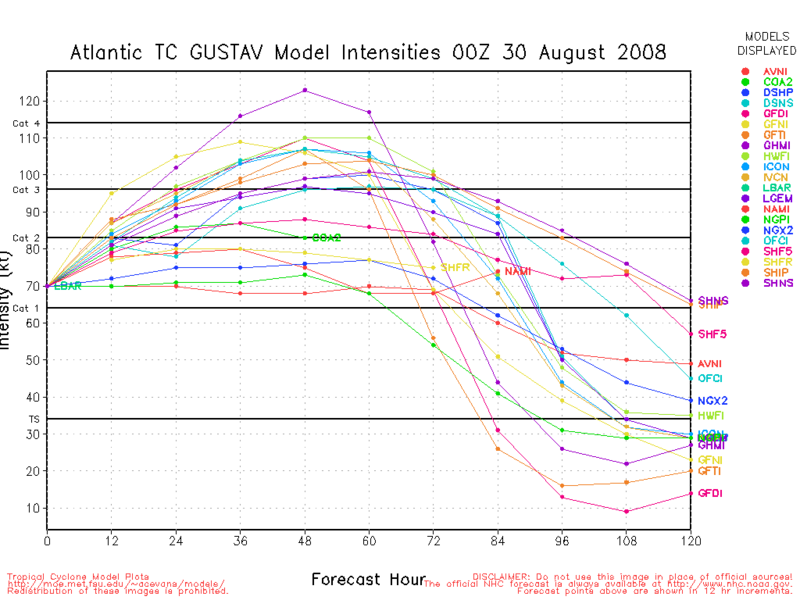 The National Hurricane Center has slightly increased the intensity forecast to the high end of the Spaghetti model intensity graph. The forecast track has not changed much…just nudged a shade to the west. Instead of eastern Vermillion Bay…it now splits Vermillion Bay from Southeast to Northwest and then brings it to a crawl in East Texas. All indications continue to suggest that this guy will be a huge rainmaker for East Texas and much of Louisiana. While the storm surge could be as high as 25 feet in coastal regions of Louisiana from Callou Bay to Port Fourchon to Boothville. A storm surge such as that would actually cover a large part of the parishes on the coast. Some surge would also affect New Orleans with a surge of lesser amounts coming up Lake Borgne and the intercoastal waterway. If the track holds, then the surge coming from the SE up Lake Borgne probably wouldn’t be as dramatic as it was with Katrina 3 years ago. But, if the storm were to actually make landfall farther east, yet west of New Orleans, then the surge potential would increase dramatically and thus the risk increases markedly. 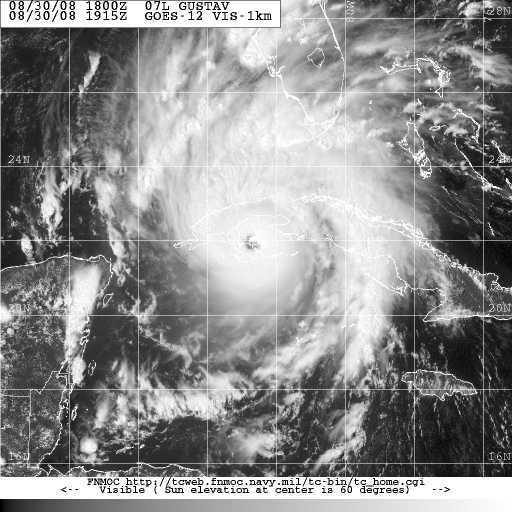 Remember, Katrina a day prior to This Date In History, did not hit New Orleans…it his Mississippi. The brunt of the storm surge went into Mississippi. 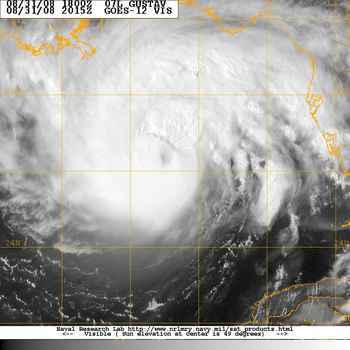 Katrina was a cat 3 storm when it hit near Venice but it had a storm surge comparable to that of a cat 5 hurricane. I’m going to direct you to the blog I posted last year on the subject. (CLICK HERE…ITS WORTH YOUR WHILE) In the blog is a link to the New Orleans Times-Picayune website and a very good explaning map of how the flooding unfolded with a time line and graphical representation. It is very very informative and something the national media should review before it does any stories because they can learn something from it. It was very informative to me and helped me understand what the real story was when Snow White and I went down to help build some houses. BTW..New Orleans is my birthplace and am very familiar with it. My Grandfather was one of the key men in building the Superdome as well as numerous other large structures in that city and others around the world. Anway….the spaghetti models have come into closer alignment on the track with about 2/3 of them going anywhere from the east side of Vermillion Bay to Cameron. A few still want to take it farther west. At this point, I would still suggest that there are variables out there that need to be considered. Landfall date or region won’t really be predictable for probably another 48 hours or so. Then the environmental steering conditions will have shown itself. 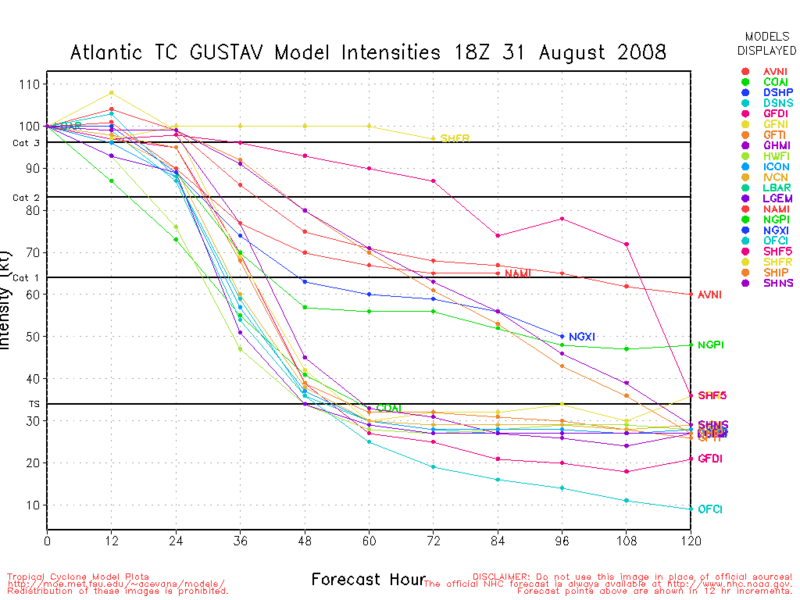 Here is the 11pm discussion for Gustav. We’ll take another look at Hanna on Saturday afternoon or evening. CYCLES… WHICH COULD SIGNIFICANTLY AFFECT THE INTENSITY. 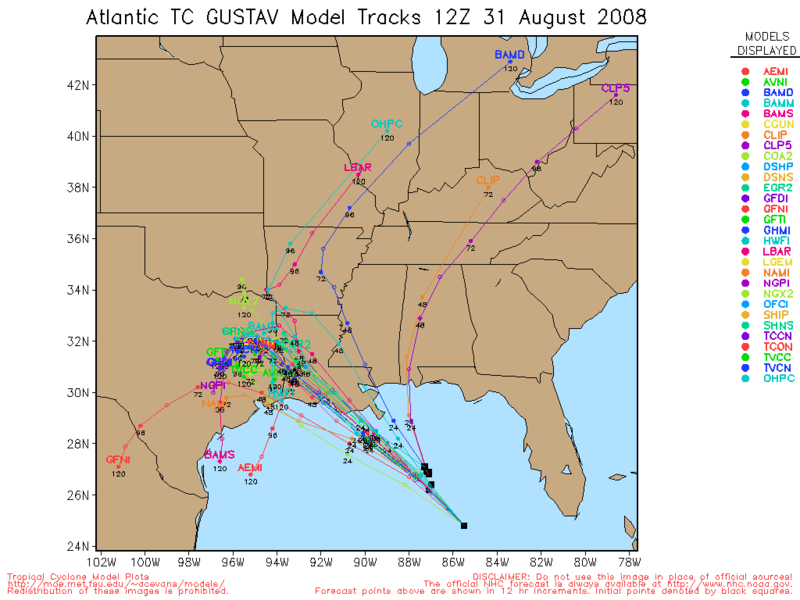 Hurricane Gustav…Which Way Will It Go? 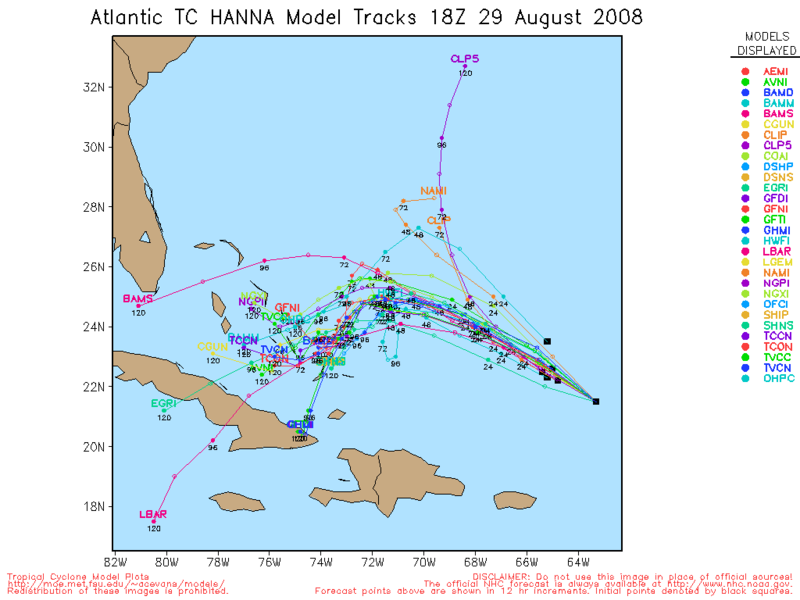 And What About Tropical Storm Hanna? I don’t have a lot to add to what I have said in the past. 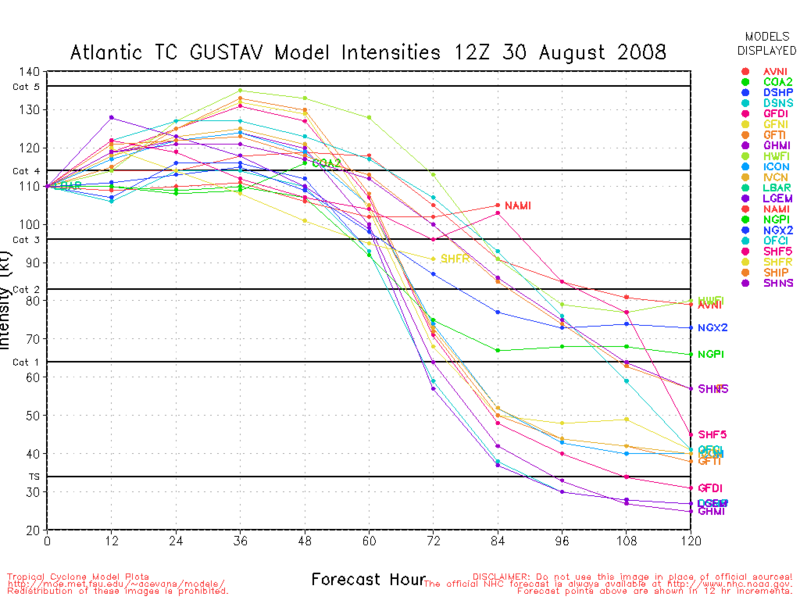 I still think that Hurricane Gustav has a good shot at perhaps being stronger than anticipated and doing so pretty quickly. consensus track. But, the fact that they have specifically said that and also outlined the other variables involved in the other forecast tracks which go farther west, then that indicates some uncertainty and, as they point out, this track should not be taken as Gospel and further review will be needed. The storm surge from this guy may be problematic depending on where it actually makes landfall and there are a number of indications that this guy gets stuck inland and could pose a major flooding threat well after landfall. 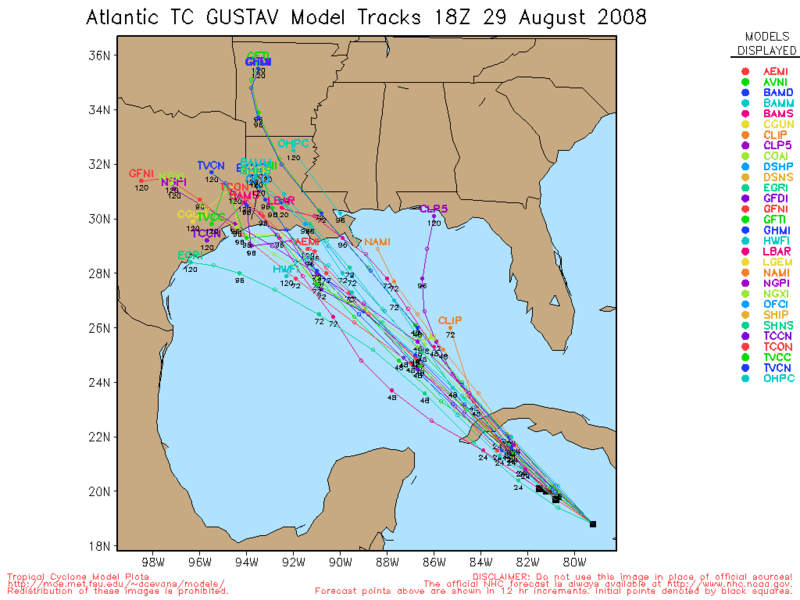 Click Here for the latest spaghetti models and previous discussion.